Here is another returning printable from last year. This one is based on 1 Peter 5:7. I used Cadbury Mini Eggs (because they're the best), but you can use anything egg related for this project. Once again, this is a bag topper sized at 7 inches wide. Links for blog-subscribers are under each picture. Personal-use only please. Thank you so much for making this! 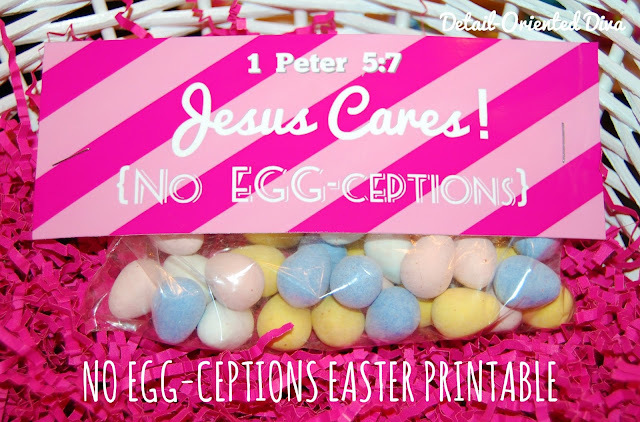 I've been looking all over for a bible verse with an egg themed for my chalk eggs I made. I'm posting a link to you today. Thank you again!!! Awesome! Thanks for sharing and following along! Thank you for posting Christian based crafts and making it FREE. I am making easter bsskets this year for my kids and will us this for their baskets ss well as making some for their class. They attend a Christian school so I'm sure the kids will llve it. Thanks again and God bless you snd your family.